The Eland is a very rare antelope species and therefore hard to find in the Kruger National Park. Below is a guide of where to specifically look for Eland in the Kruger National Park, its starts off with a list of the best areas to visit and roads to drive and there is a distribution map of the hotspots of where this animal occurs most frequently. 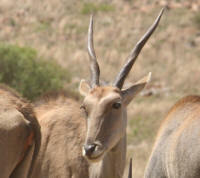 What Roads, Waterholes, Lookouts & Camps Are Best To See The Eland In The Kruger National Park?